There’s a fascinating fact that I frequently share with clients – studies have shown that sugar is equally, if not more, addictive as cocaine and heroin (two of the most addictive substances on the planet). In fact, one study that I recently read stated that sugar is actually EIGHT TIMES more addictive than cocaine. Isn’t that crazy?! In one study, Harvard scientists found that a high-sugar milkshake (compared to a low-sugar one) not only spiked blood sugar and insulin and led to sugar cravings, but it caused huge changes in the brain, stimulating the same pleasure centers as cocaine or heroin. Addiction – whether to sugar, drugs, gluten, etc – is a BIOLOGICAL disorder … not an emotional disorder, as some people think. A biological disorder means that it’s driven by hormones and neurotransmitters that fuel cravings. Eating sugar triggers production of natural opioids in your brain. These natural opioids relieve pain, and are triggered and felt in the body in the same way as opioids found in street drugs or pharmaceutical drugs. So … SUGAR ADDICTION IS A REAL PROBLEM. It’s what leads to overeating and, in turn, obesity. Did you know that nearly 70 percent of adults and 40 percent of kids are overweight?! Want to know what else sugar does to your body? Causes hormonal imbalances!!! You all know how I feel about hormonal imbalances! Just like hard-core drugs, getting off sugar leads to withdrawal and cravings, requiring an actual detox process to wean off. 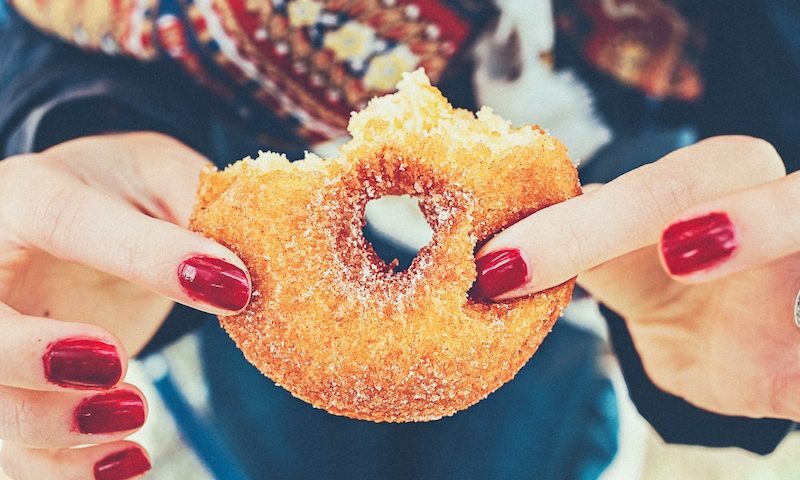 So, how do you break a sugar addiction? Let me break it down. First, it’s not easy! But, it’s absolutely worth it, I promise. I also recommend going cold turkey – eliminate ALL sugar and don’t let yourself be tempted. Sugar is a slippery slope and one cookie can quickly turn into two! Exercise in particular is known to improve insulin sensitivity, reduce stress levels, suppress ghrelin (the appetite hormone), speed up metabolism, strengthen bones, and boost your mood. It’s also a great way to take your mind off those sugar cravings! And, bonus points if you get OUTSIDE to exercise – getting lots of Vitamin D will help with those cravings too! Make sure to start your day with protein, as protein is key in balancing blood sugar and insulin and cutting cravings. Incorporate nuts, seeds, eggs, fish, grass-fed meat, and organic poultry. Not enough sleep = increased need for energy. Getting less sleep drives sugar and carb cravings by affecting your appetite hormones. Most people turn to a quick fix when they need an energy boost – chocolate, sweets, soda, sugary snacks, etc. Instead, reach for a quick protein snack when you feel your energy crashing – organic turkey slices, hard boiled egg, grass-fed jerky, or raw nuts and seeds. I’ve said it before, and I’ll say it again – FAT DOES NOT MAKE YOU FAT. Fat makes you full, balances your blood sugar and is necessary for fueling your cells. Along with protein, have good fats at every meal and snack including nuts and seeds (which also contain protein), extra virgin olive oil, coconut oil, coconut butter, avocados, and omega 3 fats from fish. Stress leads to hormonal chaos. It leads to a spike in cortisol, which makes you hungry. I encourage everyone to have a wind down routine in the evening – take a bath, read a book, meditate. If you find yourself in a stressful situation during the day and need a quick fix – take 10 deep belly breathes. I promise it will help to relieve stress ASAP! See … it’s not that hard to detox from sugar! Ok, it’s not easy, but once you’ve eliminated sugar from your diet permanently, you will feel 100% better. That’s a fact! What’s your favorite protein-packed breakfast to start your day? How do YOU detox from sugar? What’s your favorite way to re-energize when the 3pm work day slump hits? Spread some Sugar Detox lovin’! Sharing is caring, and I bet you have some friends who would love to read this too :).